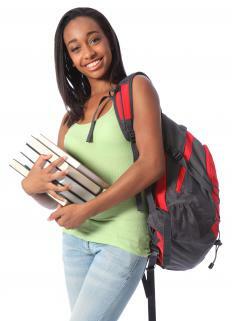 Scholarship endowment funds may help cover costs of textbooks and other expenses. A scholarship endowment is a fund a college uses to pay for scholarships. The fund may be general in nature or it could cover a specific scholarship, depending on how the institution sets it up. Colleges rely on such funds to provide financial assistance to needy or deserving students, and the money is subject to special tax treatment, allowing colleges to invest it to grow the endowment while enjoying reduced tax liability. When a college or university creates a scholarship endowment, it has to designate the funds for scholarship use. Sources can include donors to the college, internal funds, and grants from community agencies or governments. The college has the right to invest the money to increase the size of the endowment over time and can supervise this process or turn it over to an investment manager who will handle the funds appropriately. To qualify for tax breaks, the college may have to follow some special rules. These can limit the type of investments and may require the college to disburse a set amount out of the fund each year, showing that it is being used for scholarships and not other purposes. In some cases a fund may be established to fund a specific scholarship, such as an award given in the name of a particular person or a support fund for students in a given area of study. Other endowment funds are more general. To access scholarships, students fill out applications, and financial aid officials or members of a review committee determine if they are eligible and decide who to grant funds to. Disbursements from the scholarship endowment fund usually go to the financial aid office, which may deposit the money in the student's account, or use it directly to pay housing, tuition, and other costs, depending on the structure of the scholarship. Some require students to use the money only for direct academic expenses, and the students may never handle the money themselves. The size of a scholarship endowment can vary. Colleges accountable to members of the public, like state universities in the United States, must distribute information about the condition of their endowments, including disclosures of whether funds grew or shrank in a given fiscal year. Private schools do not have this obligation, but may issue an annual report for donors providing information about the college and including a discussion of the health of the scholarship endowment fund, with the goal of encouraging donors to give. What Is an Endowment Report? What Are the Best Tips for Endowment Investing? What are the Different Types of Endowments?